State Rep. Jean Evans, R-Manchester, is stepping down to become Missouri Republican Party's executive director. A state representative from St. Louis County is stepping down to take on a key role in the Missouri Republican Party. Rep. Jean Evans, R-Manchester, will be resigning soon to be the Missouri GOP’s executive director. Evans will be slated to run the party’s day-to-day operations and follow through on Republican goals. Evans told St. Louis Public Radio on Tuesday that the decision was bittersweet, as she enjoyed being a legislator since getting elected in 2017. She said both Gov. Mike Parson’s office and Missouri Republican Party Chairwoman Kay Hoflander approached her about the opportunity. Among other things, Evans said she’s especially looking forward to developing new talent for the state party. In addition to working in the real estate and investment industries, Evans was a volleyball coach and official for roughly 30 years. In many respects, Missouri Republicans are at the pinnacle of power in Missouri. They hold commanding majorities in the Missouri General Assembly, as well as every statewide office except for auditor. But the party slipped in some key suburban areas last year, most notably St. Louis County. During the U.S. Senate contest, U.S. Sen. Claire McCaskill defeated Republican nominee Josh Hawley by more than 100,000 votes in the county. Even though Hawley won his race comfortably, incumbent GOP statewide officeholders could be vulnerable if rural and exurban counties don’t turn out as strongly for Republicans in 2020. Evans said she was able to win re-election in her St. Louis County-based district that McCaskill won by finding commonalities with voters on key issues. 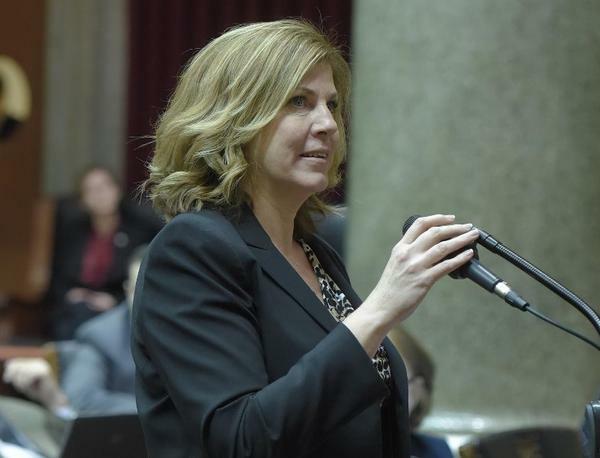 “She understands as I do that Missourians have entrusted Republicans with tremendous influence over the future direction of our state and country, and we’ll work closely together to win Republican victories all over the state,” Hoflander said. Once she resigns, Parson will be responsible for calling a special election for the 99th District House seat — which takes in parts of Manchester, Valley Park and Twin Oaks. Evans won re-election last year by about 1,100 votes. Copyright 2019 St. Louis Public Radio. To see more, visit St. Louis Public Radio.